I love Sandra Bullock in movies (Miss Congeniality, Premonition, Speed) and upon hearing her win an Oscar for this movie, I just had to see it. 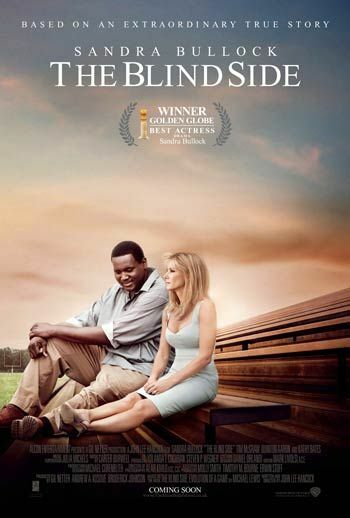 This is the true story of American football player Michael Oher (Quinton Aaron) who is from a poor background, taken in by Leigh Anne Tuohy (Sandra Bullock) who treats him as her own son and guides him to obtain an education and a future he deserves. Although no one else would give Michael a second glance, Leigh Anne's faith in his character pushes her to pull all the stops to change his life, but he is also changing hers, opening her eyes to a world she will never forget. The intrigue of the film is sustained by the reorder of scenes- the interrogation scene at the beginning definitely keeps you in your seat as you want to find out what that's about, even through the rather dull introductions of inviting Michael to the house and all the settling in parts. When we get to the real action of the film, which is for some the football games, there is great intensity that has already built up as you grow to like the characters and feel for them. For me, the real action is whenever Sandra opens her mouth and says something witty, with "crotch face" being just one of the many retorts. In this way, the real focus of the film isn't the football (you don't have to know much about American football to enjoy it), Michael Oher or even Leigh Anne, but the relationship this woman has with who is initially a complete stranger and the faith she puts in him despite great opposition from teachers, her friends and society as a whole. This, the film portrays excellently. The contrast between the rich and the poor- their dress, interior decor, slang etc. This point reappears at the end to draw focus away from Michael's final success and back to the main message of the story, which I really like as it gives meaning to the movie. Also stars Kathy Bates, Andy Stahl and Ray McKinnon. Sandra Bullock picked up an oscar for her role as Leigh Anne Tuohy which is fully deserved. She had a sassy, witty and strong personality which is similar to her character in "Miss Congeniality" +25 years. Subtle expressions and extremely witty lines gave her character immediate likeability and she is someone you'd want to be friends with in real life. In this way, her portrayal is genuine and completely believable. Quinton Aaron who plays Michael Oher had a sustained blankness at the beginning which slowly develops into a person full of character and humour. As an actor, he was definitely subtle but he didn't shine compared to Bullock. What I'd usually describe as a drama, "The Blind Side" is instead an uplifting and touching true story. If any other actress had played the role of Leigh Anne Tuohy, I may not have liked the movie. Sandra Bullock is a star and she has the attitude that makes her lines believable and gutsy. She truly deserves her Oscar and arguably makes this film what it is. At two hours long, the time flies by.